It’s pretty impressive when someone can make his own initials into a worldwide brand for products that give thousands jobs, but that’s the story behind French design Yves Saint-Laurent, as told in a story posthumously (YSL lived 1936-2008) by his lifetime lover Pierre Berge, in the documentary “L’Amour fou” from director Pierre Thorreton, and IFC Films, Sundance Selects, and Sophie Dulac. The film has a lot of older backfootage, some in black and white, which contrasts with the opulence of their homes, in Normandy, Paris, and particularly Marrakech, Morocco. They broke up once, at mid-life, when YSL was having his bouts with substance abuse. Pierre , who talks very dispassionately, just got up and went to a ritzy hotel. The younger YSL, in BW footage, looks vigorous, if just a but foppish and not too virile. The film focuses on their homes, their collections and their relationship (up to a point), but not so much on YSL fashions; this was not like "The September Issue". The YSL brand actually refers to the "fashion house" that Yves and Pierre founded together, and is still very strong today. I saw it at the late Saturday night show at Landmark E Street, and the attendance was disappointing, as it was shown in the largest auditorium, expecting possible sellouts. 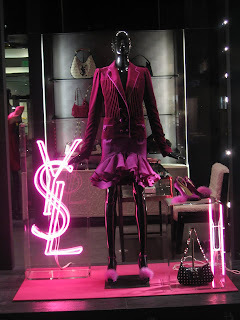 Wikipedia attribution link for Beverly Hills picture of YSL storefront, pd.